What Is Stock Market Volatility Telling Us Now? In my last article, ‘Plunge Protection Team Spotted Atop Mt. Everest’ - 02/02/18, I warned readers that the Plunge Protection Team was again active. I posted the article on my blog www.bmfinvest.blogspot.com. This article was published as well on the site www.marketoracle.co.uk and almost nowhere else. Let me say ‘kudos’ to the marketoracle.co.uk publisher Nadeem Walayat for not only having the guts to publish the truth but also the expertise to understand what is happening. I start everyday with a thorough reading of the articles published on marketoracle.co.uk as it is one of the few sites where writers like myself are given a forum. Almost all the other supposed ‘investment’ sites are filled with powder puff CNBC kind of stuff. I can assure readers that if they are not reading articles posted on marketoracle.co.uk, they are not getting a complete idea of important information. Funny, there has been a lot written this week on ‘what happened to volatility?’ Really? I thought I explained this a week ago. I presented a chart showing pretty clear PPT intervention in equity markets as early as a full week ago. Why are so many so late to the party? Now, a week later, some writers are ‘musing’ about the PPT and their interference in equity markets. I can assure readers that we have all seen this movie before. Whenever stock prices look ready to crumble, the PPT steps in to rig prices higher. One would have to be a complete ignoramus to believe we all live in freedom or that capitalism exists. Why is the activity of the PPT important? Because the PPT IS the ‘market’. The PPT IS the ultimate put option. Whenever they pop out, it tells us that index prices are failing. Why this week? Fed Chair Yellen ended her term and Fed Chair Powell took over. As I have written over and over. whenever the Fed Chair is away from the ‘call option’ button at the New York Fed, stock prices fall. No doubt Mr. Powell spent Tuesday in orientation and stocks sure enough fell. Of course, there are many reasons to sell stocks now. Valuations are ridiculous and sellers have not been allowed to sell for many years. Thus, we now live in a bubble. As President Trump said prior to election, “…one big, fat bubble”. The Fed has been pushing interest rates higher. Pop! A country $21 trillion in debt cannot afford higher interest rates. At any rate, look at the chart below for a 3-day, 30-minute interval chart for Tuesday through Thursday of this week. Again, I circled the PPT activity as we can see several near-thousand point reversals from persistent selling nadirs. Also note the heavy volume associated with these powerful moves higher. I worked as an investment adviser for the past twenty years and I can assure readers that these sudden and violent reversals from selling to buying are not the work of investors. Whenever stock prices plunge, investors never call to say, ‘Things look cheap - let’s buy’. No body. No one. Never, ever, never. Not once. Ever. This is the work of the central bank. Why? The money they use is not theirs. They steal it from us. They have no risk. Everyone wants to know. How do they do it. Call options. As anyone trying to trade on Tuesday morning will tell you, all systems were down to a crawl. TD Ameritrade in particular was quite impossible. What does this tell us? It tells us that somebody was pushing so many call options into the system that the little guys were locked out. High frequency trading allows the criminals to hijack the system with massive call orders, most of which they quickly cancel to hide their tracks, to jam prices higher. See the chart below. It speaks for itself for those who want to listen. Violent stock price movement is attributed to ‘volatility’. The ‘volatility’ index is known as the VIX. Actually, the value of the VIX is determined by the expense to own put options. As the next chart will show, stocks have been going straight up for some 15 months without even a single monthly loss. The VIX has set all-time lows. There has been no reason to own puts. Now there is. Now ‘volatility’ is moving higher. So how did we get here? 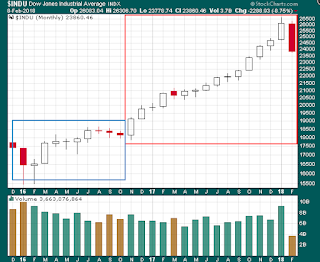 The next chart below is a 2-year monthly look at the Dow Jones Industrial average. I enclosed President Obama’s last year in blue and President Trump’s first year in red. Clearly we can see that stock prices were fading and getting ready to tank with the prospect of Criminal Clinton becoming president. Stock price performance in President Obama’s years was actually quite pathetic considering the Federal Reserve and the PPT unleashed bailout after bailout and QE after QE to boost prices. Political policies were not helpful. Then, literally as soon as it was apparent that Mr. Trump had won the Presidency, stock prices vaulted higher. Given the monthly chart, stock indices have yet to experience but a single negative month in President Trump’s tenure thus far. Until now. PPT and central bank intervention have been a world-wide phenomena for years now. Like steroids, interventions work. Like steroids, there can be adverse consequences. Bubbles eventually pop. Whenever we see evidence of PPT activity, we know the bubble is bursting. Readers have now been warned. Now take a look at the chart. 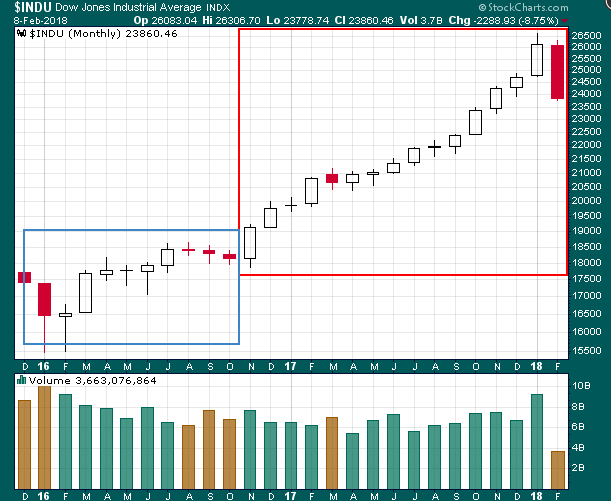 Given that the Fed has apparently drawn a line in the sand at Dow 24000 or so, does anyone expect stock prices to continue to fall on Friday? I myself would be very surprised if we don’t see vociferous buying coming from the PPT. Before I leave the second chart, I must admit Senator Shumer was right when he said the remarkable bull run in stock prices over the last year was not to be credited to President Trump but rather former President Obama. Senator Shumer was right. All Mr. Obama had to do was step down and get out of the way. And, most importantly for stock prices, Ms. Clinton was defeated in her bid for the presidency. Without trying to be too lengthy, let me leave readers with an example of how corrupt the american system is. Duke Energy is one of the largest energy providers in the US and they serve us here in the US Southern states. As we say down here, ‘American by birth and Southern by the grace of God!’ Anyway, Duke has recently been fined $102 million dollars for polluting ground water with coal ash. The company said they will clean things up and pass the cost on to customers. The little guy gets screwed and nobody cares. Now, check this out next time readers want to cross their heart and praise the flag of the country that used to be America. Several years ago Duke’s very own engineers suspected some of their pipes used to disburse the pollution were having problems. They requested $20k to inspect these pipes. The company turned down their request. The pipes burst and the pollution occurred. Duke even pled guilty in court admitting their fault. Get your barf bag handy. In April of 2015, the company announced a $1.5 billion dollar stock buyback program. They would buy the stock from formally broke bankers Goldman Sachs and JP Morgan. Given that both banks were bankrupt ten years ago, where did they get money to acquire $1.5 billion dollars worth of Duke Energy stock? From us, fool! It gets worse. The CEO of Duke makes $13.4 million per year and $9 million of that last year was Duke stock. The top five Duke execs make some $28 million per year. The company estimates if they have to clean up all their spills, it might cost some $10 billion. Given that the company pays enormous salaries to those who prevent inspections of potential pollution events, and given that the company can spend billions to buy back stock, paying hundreds of thousands in commissions to criminal banksters, just so they can drive the price of Duke stock up and get rich, and then stick the cost of higher stock prices and pollution clean up to their customers, one can conclude that all that matters in america is higher stock prices. Thus, the PPT rides to the rescue of rich investors who only buy and never sell. Plunge Protection Team Spotted Atop Mount Everest! Many market observers would agree that the current stock market is either in a bubble or at least richly valued by historical standards. Not that it matters. The Dow’s ascent looks like Mount Everest complete with a lack of oxygen at the top. All that has mattered when it comes to stocks for thirty years now is the Federal Reserve and their ‘Plunge Protection Team (PPT)’ activities. When stocks needed a boost, they were there to buy market indices back up when no one else would dare. Since the election of President Donald Trump, market indices have been moving straight up. The PPT has not been needed. There have been no sell-offs. That is, until the very end of January, 2018. Even then, the Dow dipped just a couple of percentage points. Why? As I mentioned, everyone agrees the current market is a bit pricey or perhaps even bubbly. Maybe the stock indices are due for a pullback. But mainly, investors are gauging the Fed’s anticipated moves. The Fed is raising their fed funds interest rates and in turn, the US 10-year Treasury yield has risen to over 2.7%. That doesn’t sound like much but yields haven’t been this high in four years and the stock plunge of ’08 was triggered in part by yields in the upper 4% range. One or two more bumps from the Fed and US 10-year Treasuries might well yield north of 3%. Since we have been living in an economy propagated by near-free money, maybe a rising cost trajectory of money will trigger the next bear in stocks? The future of stock indices really is in the hands of the Fed. So we finally got not one but two days of selling in the US stock indices largely due to Fed worries. Alas, the Fed met on January 31 and took no action. Selling intensified after the Fed’s announcement on the 31st and then the clock struck 3PM. And out they popped. I could hear the sirens sounding the alarm from my office! Suddenly, from nowhere, buying programs kicked in. On Donar and Blitzen and…, oh wait a minute -that’s a different Santa Claus! 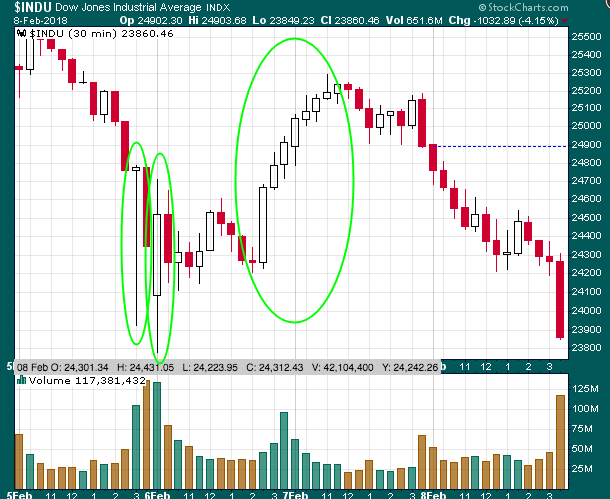 I personally measure PPT activity when the Dow experiences at least a 100-point upside move in an hour. By the end of the trading day, the Dow had recovered nearly half of the days 300-plus point intraday loss. All in less than an hour! 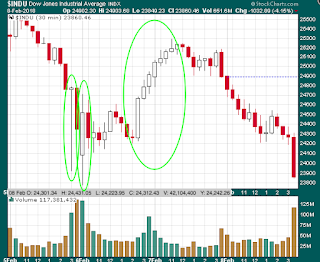 green circle shows a quick 200 point recovery in about thirty minutes. Yeah, that’s normal. A little more selling pushed the Dow lower and then a third PPT program kicked in. More selling threatened to send the Dow down for the day but that was not allowed. 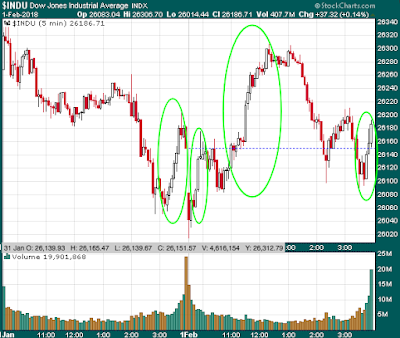 The fourth green circle shows an end-of-the-day buying spree reminiscent of the previous day. This is a 10-minute interval chart so check out the trading volume at the bottom bar particularly at the end of the day Feb. 1. What does this tell us? What does the Fed want us to believe? One - Even though Dow valuations are very high, the Fed does not care if they are standing atop Mount Everest. They are going to grow the mountain higher. All they care about is their evil luciferian control over all of us. Two - The Fed is willing to support stock prices as they raise interest rates. Three - The Fed is perfectly willing to blow bubbles as long as they get to search all partiers for sharp objects. Four - The mood suddenly feels like early 2009 again as the Fed signals for us to don the oxygen masks. We are about to do some climbing. They will not let us fall. Five - The Fed now realizes that the party is almost over. They must once again assume full control of stock price direction. Six - A fall from atop Mount Everest will certainly result in death. We may have a million good reasons to sell stocks and wait for the crash, but we only need one good reason to ignore risks and buy our brains out. That is, we can see the PPT standing atop Mount Everest with buy orders in their hand. But is this action prudent and will the Fed again find success? If the Fed fails now, we are likely going to experience a very different world on the other side of the QE - PPT door. Barry M. Ferguson is a former investment adviser and President and founder of BMF Investments, Inc. He has authored the books, Navigating the Mind Fields of Investing Money and Pulpit of Power, lectured on investing, and contributes investment articles to various professional publications. He was presented with the prestigious Cato Award for Distinguished Journalism in the Field of Financial Services in 2009.